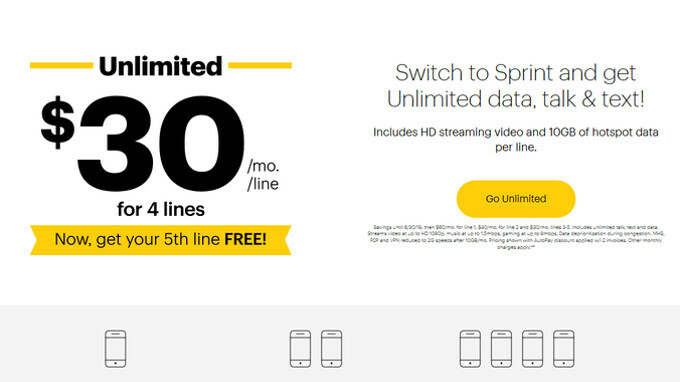 If you have signed up for one of Sprint's "Unlimited Freedom" or "50% off" promos, be warned that analysts expect Sprint to begin calling about 300,000 subscribers before the early adopters deals' end this January, and keep on notifying those whose plan prices are about to get an increase, depending on when they signed up for the goods. The older, "50% off" deal, was introduced in November 2015, undercutting Verizon, AT&T and T-Mobile plans at half off. The offer was valid until January 8, 2018, so next billing cycle could be a pain. "Unlimited freedom," on the other hand, gives five lines of unlimited data at $20 apiece, but has an expiry date of January 31st, after which you'd be paying extra $30 per month. Analysts are even baking in a higher churn rate for Sprint in this quarter, due to the possibility of customers getting surprised by the price increases, and flocking to other carriers. Sprint is known to extend its promos in the last minute, but this might not be the case this time, as per its spokesperson quote above, so we'll see how many of its subscribers will be affected by the expiration of "Unlimited Freedom" and "50% off" this month. It's called introductory rate and hooking the client for an immediate sale rather than keeping a customer for at least 5-10 years. This marketing strategy always backfires. I had Sprint for many years, but after their network size stopped growing, I left Sprint for Verizon. Sprint should keep the price of their plans low, seeing as their network hasn't improved by all that much. They are lucky that they are merging with T-Mobile, because they really don't offer all that much anymore.